Takashi Amano's "Forests Underwater" launches the amazing world of tropical forests and their aquatic sistems through an outstanding largest nature aquarium in the world with 40 meters long and 160,000 liters of fresh water, which can be seen at the Lisbon Oceanário. Amano was the creator of the Nature Aquarium concept and visual aquatics master. I am a tropical fish hobbyist since the age of 13 and his aquascaping has inspired me from the moment I saw his work long ago. Sadly, he died a couple of months after the opening in Lisbon. Wonderful composition. Love the colors as well. Lovely to hav you back. I don't think you have ever shown us your own fish. Aquariums are magic. I was reading the other day about the huge and numerous forests underneath our seas! Fascinating stuff. Your image is excellent. Sorry to hear about Takashi Amano. Good to see you back, though. Hope that all goes well with you! We're glad you are back, Jose, and with such a nice post. Wow - that is lovely. A great testament to his life's work. Oh, welcome back, Jose!! So good to see you online again!! And what an awesome image this is!! A great testament to his life indeed!! I hope you have a wonderful weekend!!! Enjoy!! That is beautiful, JM! We always had a fish tank at home when I was a kid. Wow, this image is fantastic. I love it! A beautiful shot, and it is good to see you back. Incredible exhibit. Hey you have been missed online. I can't wait for the rest of the series. This is beautiful! I join the others is being glad to see your return to the blog. That's a very fine image. I love the colors. Una foto genial! Composición y colores guapísimos. Really nice to see you again here. You started the new beginning with a lovely and beautiful photo. This is a striking image. My eyes can't quite figure out up from down. Lovely images. The Lisbon Oceanarium is the best I've ever seen! Nice to see you back, hope all ok with you. How fascinating, colorful, and inspirational. I also hope these kinds of exhibits will influence people to stop polluting the oceans and abusing marine animals. Words cannot express the beauty. One can only relate and react on a deeply emotional level. He did beautiful work and will be remembered through his underwater seascapes. 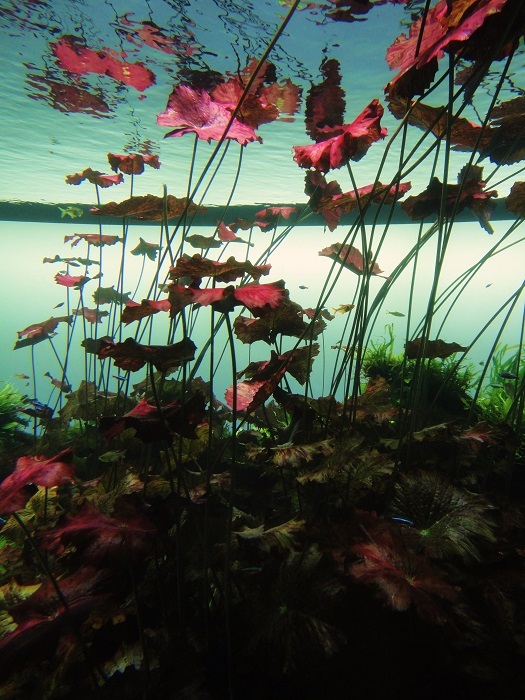 I love that last photo with the red plants and seem to be blooming in their underwater setting.